Propolis is a resinous substance collected by bees from poplar and conifer buds. Supports the body's natural immune response effects of free radicals and/or oxidative stress. Has antioxidant activity & can therefore assist in protecting the body from the harmful effects of free radicals and/or oxidative stress. 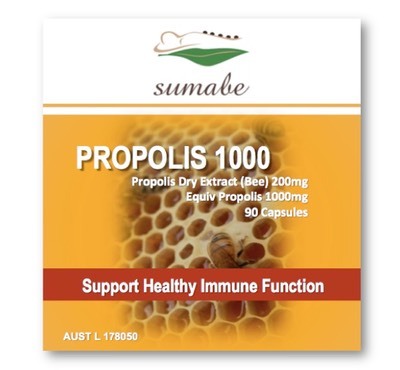 Sumabe® Propolis Liquid 40% is gathered by bees and has very high BIO flavonoid levels. BIO flavonoids can be helpful in maintaining a healthy immune system. Propolis is a powerful remedy to relieve the symptoms of colds and flu. Topically it is helpful for treating a whole range of minor skin conditions and wounds. It may also help in increasing the body's immune system. Apply directly in the mouth or throat using a dropper. Or mix 4-6 drops of the Propolis Liquid in water. Use as gargle or drink up to 3 times a day. May be applied directly to wounds and burns. Propolis may cause allergic reactions. If irritation or swelling of the mouth or throat occurs -discontinue use. Sumabe® Propolis is a resinous substance collected by bees from poplar and conifer buds. It may support healthy immune system function and assist the body’s natural immune response. Propolis has antioxidant activity and can therefore assist in protecting the body from the harmful effects of free radicals or oxidative stress. Propolis 1000 helps in the maintenance of general well-being. Adults: Adults, take capsule 1 to 3 times daily, with meals, or as directed by your healthcare professional. Propolis may cause allergic reactions. If irritation or swelling of the mouth or throat occurs - discontinue use.